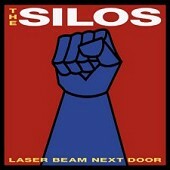 Playing with the intensity and unpredictability of a rough garage band while also pulling off the ability to play like a polished studio band, The Silos have the best of both worlds, jumping back and forth between whatever they want to do. Laser Beam Next Door is a sonic collection of blues-undertoned, punchy rock that pays tribute to everyone from Hank Williams, Elvis Presley, and The Beatles, while never favoring one influence over the other. The outcome is a potent rock album that is neither pop nor roots, just a solid kick-out-the-jams rock album sure to excite. I'll give it an A-.